The AAI-GM12 allows direct interface of any preamp level audio source to a Gm factory radio, eliminating the need for sound degrading solutions like an FM modulator. 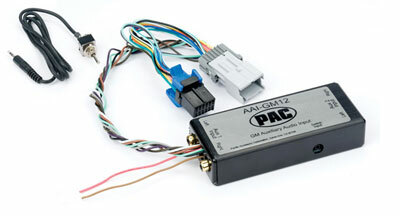 The AAI-GM12 interface inputs sources from units such as a DVD, VCP, MP3, Satellite Radio or PlayStation. Requirements: 2002-2009 SUV’s and trucks with a RDS or Navigation radio. The SUV or truck must have a factory XM receiver, factory DVD Rear Seat Entertainment (RSE) or factory/aftermarket CD changer (factory 6 disc changer built in the radio does not qualify). Perfect for SUV’s like Canyon, Suburban, Yukon. 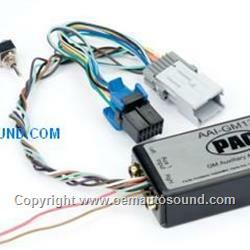 Comes with a three position switch which allows you to switch between two auxiliary inputs and the factory slave unit. High quality audio isolation IC eliminates engine noise. Internal CMOS electronic switching for long term reliability.